"My dreams, they change things for everyone. It's like the past never existed." Dr. Walter Haber: You suffer from dreams, and you took these various drugs to do what, exactly? George Orr: To try not to dream. While having been celebrated over her career for her wide range of fiction and nonfiction, winning both the Hugo and Nebula awards for The Left Hand of Darkness, her best selling Earthsea series, or the Pulitzer-nominated Searoad, author Ursula Le Guin's 1971 science fiction entry, The Lathe of Heaven has the distinction of being her only novel to receive a film adaptation. As the very first movie ever made for public television, the original 1980 version starring Bruce Davidson (executive producer on this version) and Kevin Conway has become something of a classic, lost for years due to copyright issues. To commemorative the novel's 30th anniversary, A&E sponsored a made-for-TV remake, helmed by documentarian turned feature director, Philip Haas (Angels and Insects, The Blood Oranges), and starring James Caan, Lukas Haas and Lisa Bonet. Lathe of Heaven is a mind-bending odyssey into the psyche, where reality is literally what we make it. George Orr (Haas) is afraid to dream, for his dreams change things. After being assigned to a "voluntary" psychiatric treatment for his abuse of pharmaceuticals, he comes under the court-appointed care of Dr. Haber (Caan). At first, Orr believes the doctor is another of those who doesn't believe the effect his dreams have on reality, but soon comes to realize that the doctor is in fact manipulating the world around him while George undergoes his dream therapy, using a machine known as the "Augmenter." Fearful of the consequences of the new world that is being created by his subconscious thoughts, Orr reaches out to Heather Lelache (Bonet), the attorney who helped him on his drug charges, but who in the current reality has never heard of him. When Haber, who has by now elevated his professional status through his patient's abilities, insists on Orr's cooperation in making the world a better place, George is compelled to resist. As Haber begins his own plot to continue his world-shaping work without George, a showdown is inevitable on the dream plane, where anything is possible. In order to fully enjoy this version, it is best not to have seen the original TV movie, which keeps much closer to Le Guin's novel (she helped develop that script), and doesn't skip over meaningful plot points in favor of a love story. The production values of the new version are superior, doing a good enough job portraying the elastic reality George creates with some interesting stylistic choices, but the scripting tends to muddle the many-layered story that the author is famous for. Where in the novel Dr. Haber was primarily using George for the betterment of society, the focus here is more on the doctor's personal gains. Also neglected is the notion that for every change that appears to be beneficial, there are unwanted and unexpected consequences, causing Haber to try additional adjustments, which are also glossed over, perhaps in an attempt be a bit more politically correct. The actors do as good a job with their parts as can be expected with the material, and all three leads are fine to a point, but the characters don't have the depth required to really sell themselves. The writing doesn't justify key shifts in their personalities, such as Bonnet's sudden attachment to a psychiatric patient, or leaving David Straithorn's Mannie�the one person aware of what is transpiring�fairly ambiguous. Granted, the premise and scope of this story is one that is confusing by its nature and will prove disorienting to many, but more could have been done with the social, psychological and spiritual ramifications present in the novel than were presented here. Even though it doesn't live up to its predecessors, I found the film engaging, and the story is an intelligent and thought-provoking tale, questioning the very fabric of reality itself. It isn't quite what I would have hoped for, but does at least bring some of Le Guin's brilliance to the forefront. Image Transfer Review: Lathe of Heaven is presented in a 1.85:1 nonanamorphic transfer. Colors are fairly good, but shadow detail is minimal, tending to black. There is a good deal of aliasing, and a fair amount of edge enhancement. Compression artifacts are abundant, manifesting as blockiness in backrounds, and a visible jerkiness throughout, resulting in details such as the texture of the main character's clothes jumping in and out of focus. While the effect is subtle for the most part, those sensitive to this will find it very annoying. Audio Transfer Review: The stereo soundtrack is well presented, if a bit center weighted, with appropriate use of directionality. Dialogue is easily discernable, and Angelo Badalamenti's (Twin Peaks,The City of Lost Children) score is full and lush. Extras Review: The main extra is fairly standard, 20m:45s making-of promotional piece that looks at the various aspects of the design and production of the feature, with the stars and crew giving their insight into the film. Brief biographies/filmographies for James Caan, Lukas Haas, Lisa Bonet, David Strathorne and Ursula Le Guin are also included. 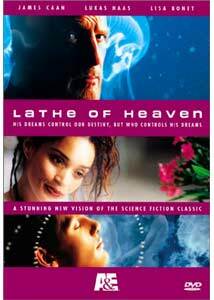 The script for this remake of Lathe of Heaven falls short of the original TV movie, but still provides an intriguing representation of Ursula Le Guin's compelling novel. Probably best as a rental.